Click on any exploded 800 series drive diagram listed below. 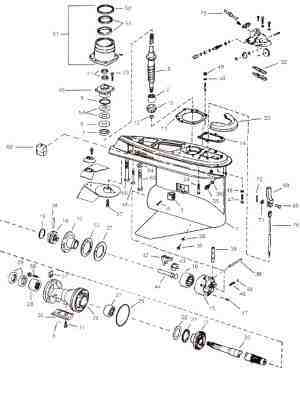 The 400/ 800 series video and drawing were made for the do it your self mechanics and the boating enthusiasts thinking of doing there own repairs. Need to find upper-lower seal kit, impeller, water pump kit and even installation help? 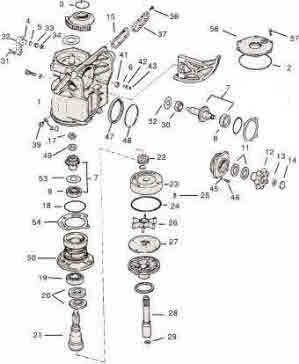 Just need the upper / lower unit exploded view gear case diagram and or video please click on the picture listed below. Flat rate repair cost for lower units and upper gear-cases. 400-800 Tru-Coarse steering for or upper gear case will be required in most cases. There is a left or right handed worm gear and 1/4 moon gear in most upper cases. Unit that do not require gears may have a steering arm attached to the exhaust housing. If you have twin engines only one will need steeling and the other will be linked to it. Most left hand worm gears in upper gear case are used with power steering applications or steering wheel in 2 location on the boat. There are 2 main types of ball gear and there is a way of making them interchange. The shaft that holds the ball gear and the drive gear can be changed out. The shaft is listed under OMC used parts and is also listed on ball gear page. Bearing for both type of shafts are the same and can be changed over. Note there is a video showing the shaft being changed over. Ball gears made in 1967 thru 1969 for 4 cylinder unit with 5/8 or so bore can not be change over but are still in stock at time of writing. Note unlike the upper gear case the press on intermediate housing ball gear can only be change by changing to newer housing and engine hub. Most people have old ball gear welded up and grounded with new seals installed. OMC 400-800 stern drive upper gear-case.